Active real-time databases have emerged as a research area in which concepts of active databases and real-time databases are combined into a real-time database with reactive behavior. However, this marriage is not free from complications. The main problem is that timeliness, i.e., predictability and efficiency, is of paramount importance in real-time databases, while reactive behavior may add to the unpredictability of the database. This survey addresses reactive behavior and timing constraints from a database perspective. 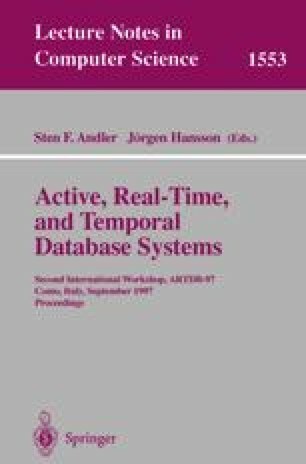 Results of both real-time databases and active databases that have impact on active real-time databases are discussed, as well as projects which have done research on active real-time databases. This work was supported by NUTEK (The Swedish National Board for Industrialand Technical Development).